The Geopark, which was yesterday designated as a UNESCO site following a vote at the UNESCO General Conference in Paris, has been shortlisted in the Destination Leadership category of The National Geographic World Legacy Awards alongside Destination Røros (Norway) and Travel Oregon (United States). Costas was given and insight into the work being undertaken by the Burren and Cliffs of Moher Geopark through the GeoparkLIFE project which seeks to balance the needs of tourism and conservation in the region through partnership. The focus of the GeopakLIFE programme is to work with tourism businesses to develop sustainable ethos, practices and tourism products, to work with government agencies and site owners in developing integrated management practices at popular heritage sites and to enable to communities to lead and participate in active conservation on tourism sites. During his time in Clare, the visiting judge from The National Geographic met with the various groups the Geopark is working with including Ballyvaughan Community development group, the Kilinaboy Historical and Heritage Group and members of the Burren Ecotourism Network. 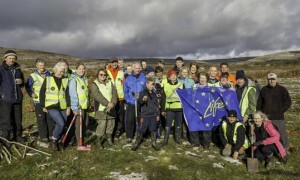 The judge witnessed the ‘Meitheal’ conservation initiative being undertaken by the Burren Ecotourism Network in conjunction with the Burrenbeo Conservation Volunteers which sees local tourism businesses giving back to the landowners whose farmland is used for recreational walking routes by repairing and strengthening routes on their property. The Geopark are hosting a seminar on their GeoparkLIFE project on Thursday at the Falls hotel in Ennistymon to update on the success of the project to date. Global Geopark status was first awarded to the Burren together with the Cliffs of Moher in 2011 for their outstanding geological and cultural heritage and has resulted in the region joining a global network of over 100 Geoparks worldwide. The Geopark is managed by Clare County Council and receives support and funding from the Geological Survey of Ireland and Failte Ireland.